← WIFE…One Word, Express In One Hundred Words In One Hundred Days. REMEMBER…One Word, Express In One Hundred Words In One Hundred Days. 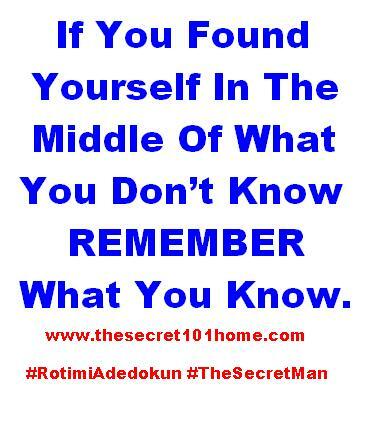 If You Found Yourself In The Middle Of What You Don’t Know Remember What You Know. What You Don’t Know Doesn’t Exist But Have Ability To Confuse You. Remember Your Vision And Dreams. Remembrance Is The Light Of Life. It Kindles Energy For Results, Strengthens The Weak, Manifests The Reality And Ignites For Greatness. Remember What You Need To Do; Don’t Be Lost Into What People Want You To Do. Remember Your Last Testimony, It Is The Secret To Dare Your Presently Challenges. Everything Is Possible If You Can Remember The Reason For Living. This entry was posted in Life and Time Management, The Secret, Vitamin Of The Mind and tagged Bishop David Oyedepo, How To Remember Other People, How To Remember Something, How To Remember Things, Jim Rohn, Pastor E A Adeboye, Remember, Rotimi Adedokun, The Secret On Heaven On Heaven. Bookmark the permalink.